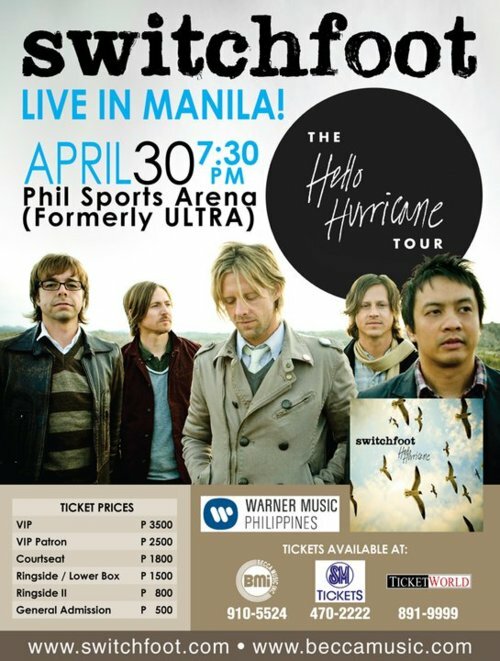 Switchfoot, one of the more popular alternative rock bands in the world today, is coming to the Philippines! This is in support of their latest effort entitled "Hello Hurricane". If you haven't heard of them, I'm pretty sure you've heard their of hit song "Only Hope" as covered by Mandy Moore (yes, it's a cover and Switchfoot is the original artist). 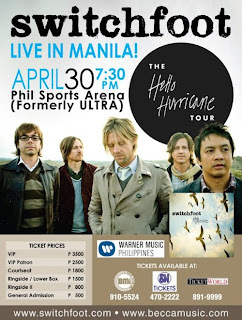 By the way, it's Switchfoot's 2nd time to play here in the Philippines and I'm sure glad they're coming back. The concert will be held at Phil Sports Arena (formerly ULTRA) in Pasig on April 30, 2011 7:30pm. My wife and I are already very excited! And if you haven't heard, their guitar player, Jerome Fontamillas, is a Pinoy! Doesn't that makes you proud to be a Filipino? !